The original homeowners—noted Los Angeles contemporary art collectors Edwin Janss Jr. and his wife Ann—commissioned architect Frank Gehry, FAIA, to design the original HideOut home in the 1970s. Although Gehry’s vision wasn’t fully realized, it’s considered to be his first single‐family project. During construction, the Jansses referenced the original plans, but modified the design, eliminating many signature details. The HideOut house eventually became a gallery‐like setting for the family’s parties, fundraisers, and private art collection, which included works by seminal contemporary artists. 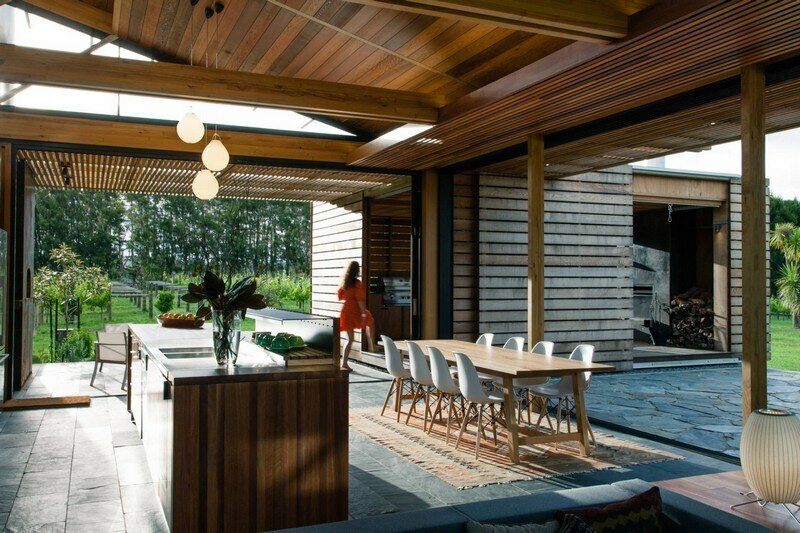 The home features an open floor plan to blur the lines between spaces. The first floor includes artist studio, living area, dining area, kitchen, multi‐purpose room/guest bedroom, tea room, bathroom, and powder room. Two bedrooms and baths are on the second floor, along with an open‐air atrium. 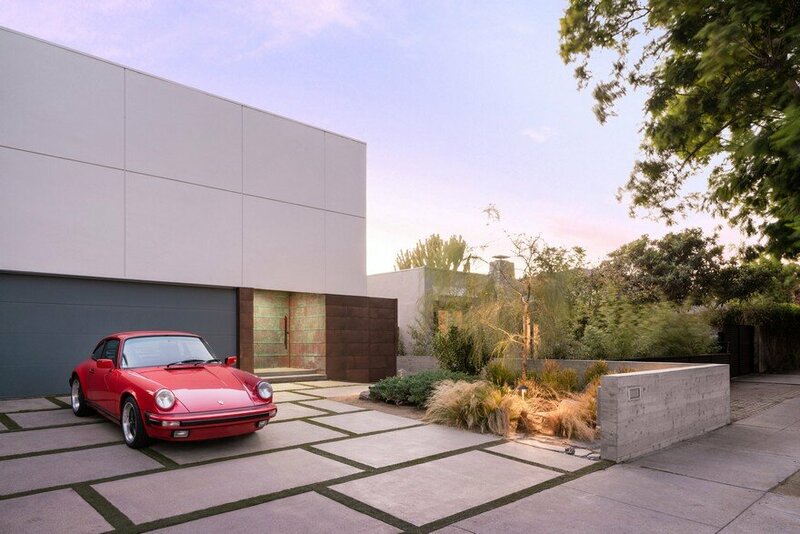 Los Angeles‐based architect Dan Brunn, AIA, Principal of Dan Brunn Architecture, redesigned the 3,600‐square‐foot former Janss Family residence—a hub associated with the contemporary L.A. art scene in the 1970s and 1980s—by using his minimalist aesthetic, while incorporating design cues from the home’s original architect Frank Gehry, FAIA. 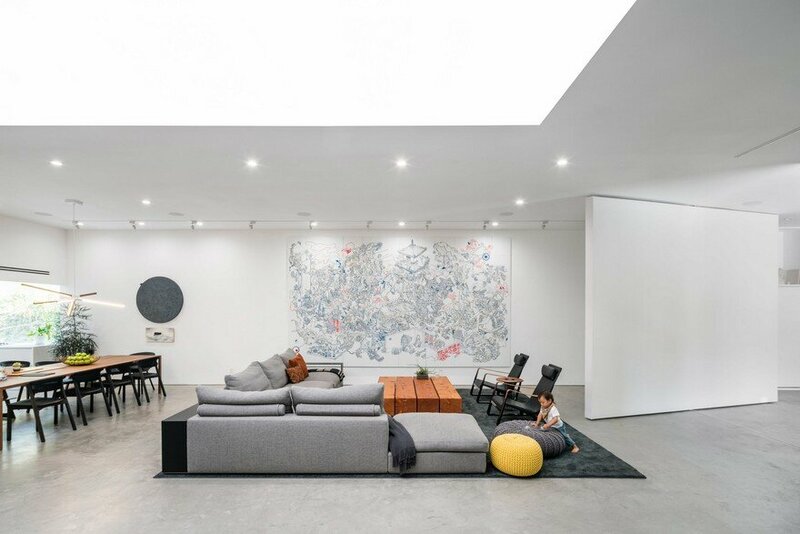 The entire first floor was gutted to create an open‐air plan that accommodates work and display space for the owner, artist James Jean, as well as domestic necessities. Interiors are arranged around an existing oversized rectangular skylight. New windows were added to bring additional natural light into the kitchen and living areas. 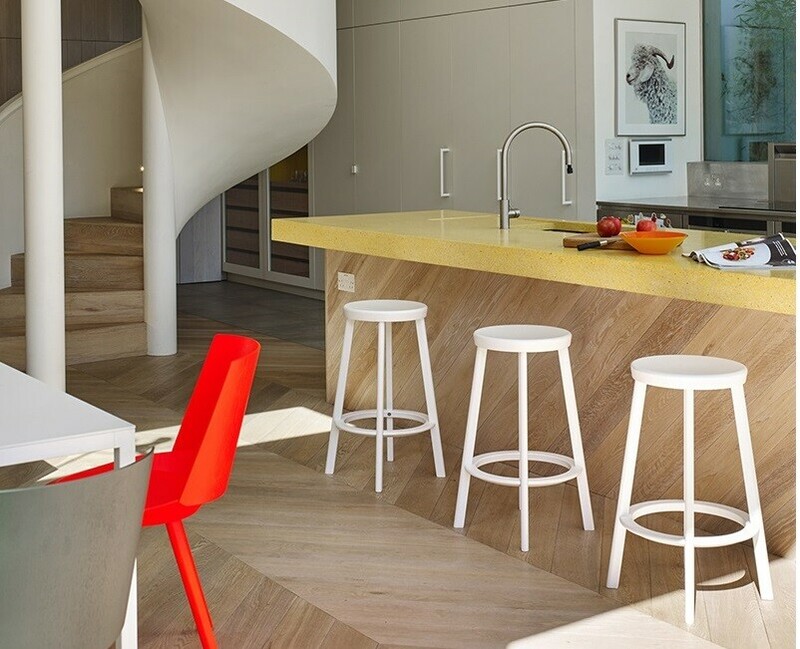 Brunn created a dynamic undulating staircase wall and utilized primary building materials—such as wood, concrete, and glass—as a nod to the architectural shapes and material palette famously used by Gehry at the time. 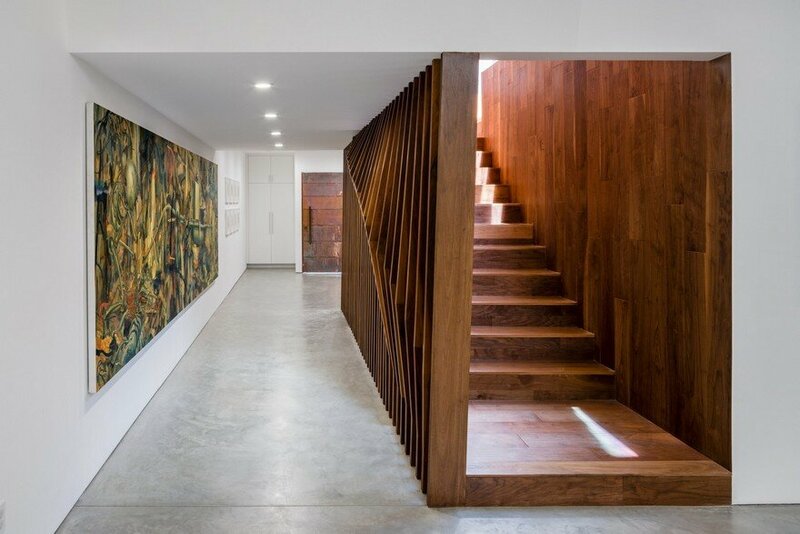 A fish‐scale copper‐clad entryway leads into a compressed vestibule that begins to introduce dominant themes of white vertical planes and the concrete ground plane, both disrupted by walnut surfaces. 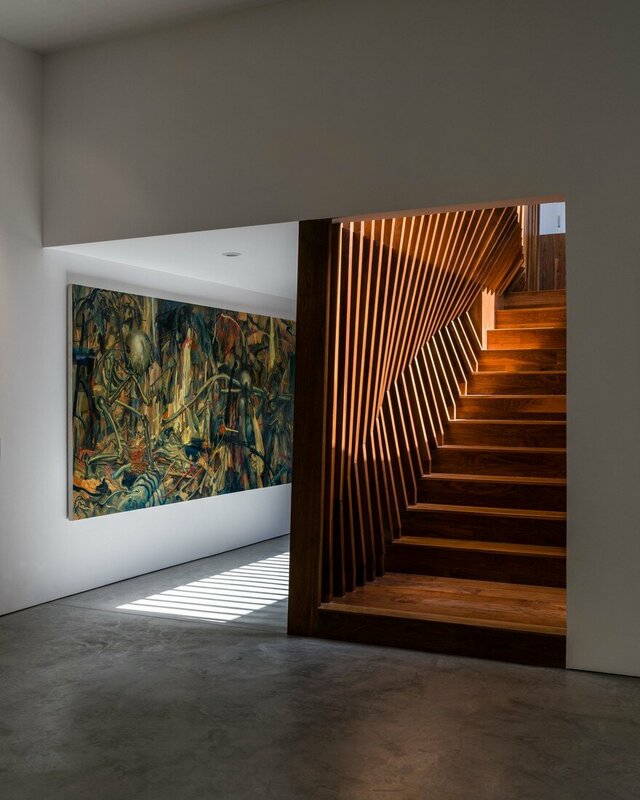 Before the expansive living area, the sculptural statement of the home emerges in the form of an expressive stairway. 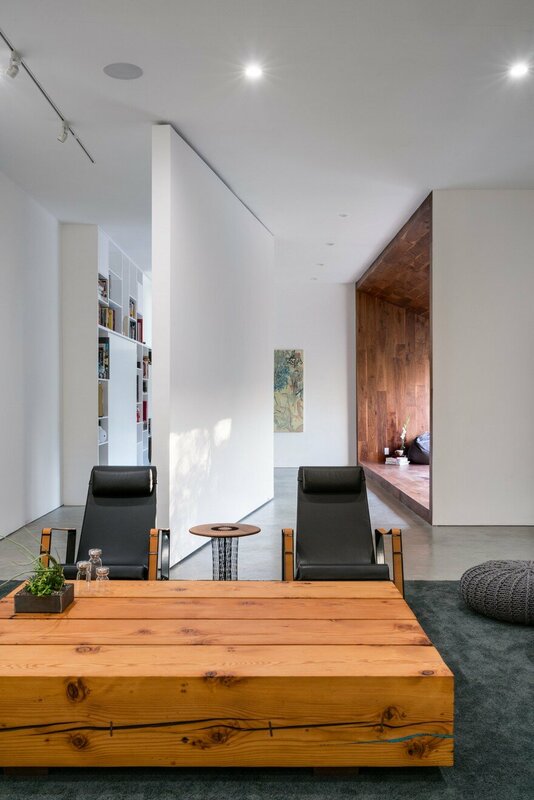 The first hint appears upon arrival, with the beginning of a walnut wall leading from the entry into the living room, but with a slight protrusion into the walkway. The shifting shapes and angles are in homage to Gehry as well as to Jean, who features flowing arabesques in his detailed work. 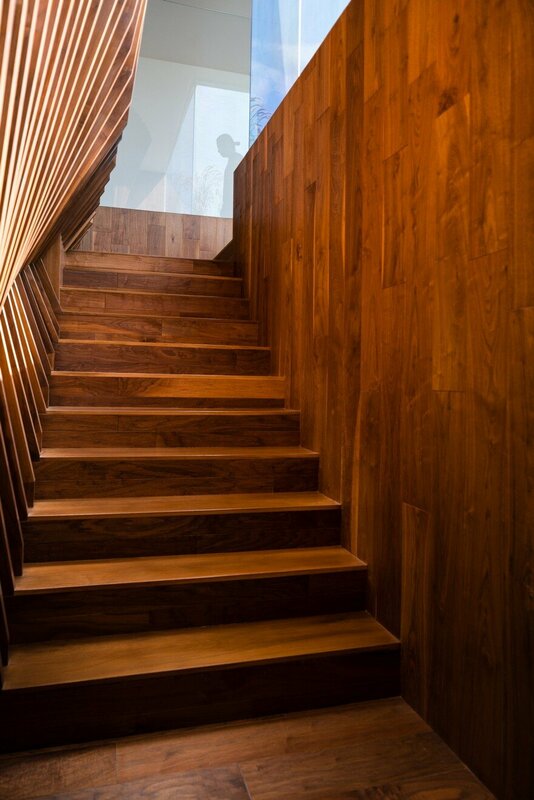 Handcrafted, the walnut staircase extenuates the verticality of the space, beckoning one up the stairs. 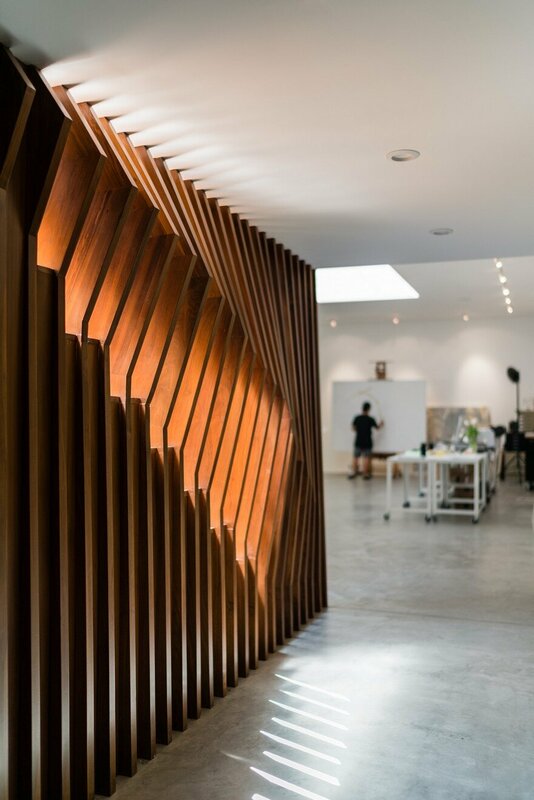 The dynamic swoosh shape captures the light throughout the day, accentuating the golden tones of the wood, as the slats encourage a dance of light and shadow. Planes continue to shift as one moves around the stairs, creating varied experiences going up and down. Brunn instilled a feeling of openness and continuum throughout the first‐floor home/work space. Interiors are meant to serve as a gallery‐like setting for the homeowner’s changing art displays. The rectangular skylight (the only architectural detail executed from Gehry’s original plan) remains as a fundamental design element. Brunn re‐thought it by outfitting it with stretch fabric to create an ambient glow, and installing LED lights that can emit glowing color. During the evening hours, the glowing ceiling plane transforms the mood of the space through the play of color. 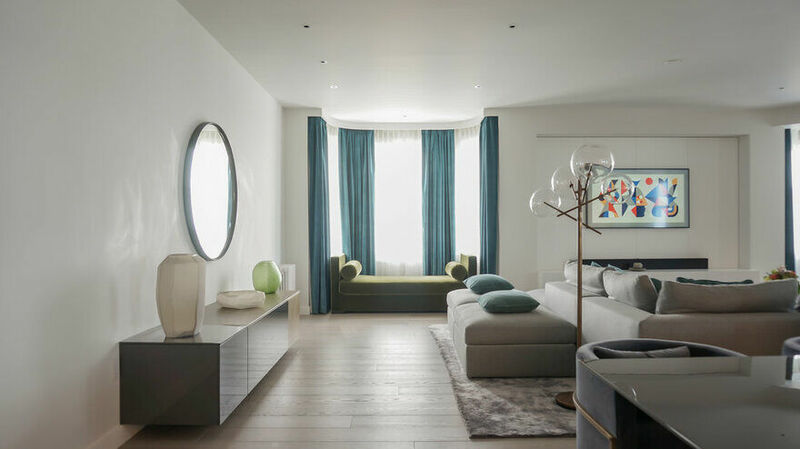 Minimal furnishings define “rooms” within the open plan and provide comfortable seating, yet allow art to remain center stage. A charcoal‐colored area rug demarcates the conversation area bound by an Italian sofa with integral shelves in the arms and two black‐and‐tan leather sling chairs designed by Jean Prouvé in 1930. The reclaimed timber coffee table is custom made for the space with traditional Japanese joinery. It is a fitting counterpart to the fine and intricate lines found in a massive canvas by Jean that overlooks the living area. Adjacent to the living space is the dining area and kitchen. 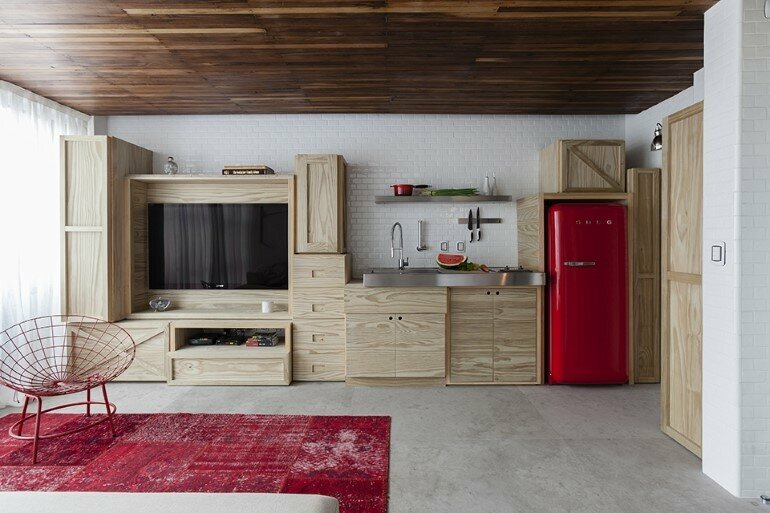 The kitchen wall features a folded partition to conceal appliances while hosting parties or entertaining guests. The all‐white kitchen is serene, featuring white back‐painted matte glass along built‐in cabinets and drawers. Adding dimension to the all‐white surfaces, Brunn plays with material finishes—from matte to glossy—to accentuate differences in utility. The cooking area looks onto the new garden through a new frameless window spanning from the countertop to ceiling. A thin‐planked Caesarstone “Pure White” kitchen island is sleek and elemental, with flowing waterfall edges. Similarly constructed, the wood dining table just beyond carries on the minimalist aesthetic. Black wood‐and‐mesh dining chairs surround the long table, which sits under a “Sky Bang Chandelier” of wood‐trimmed strip lights. 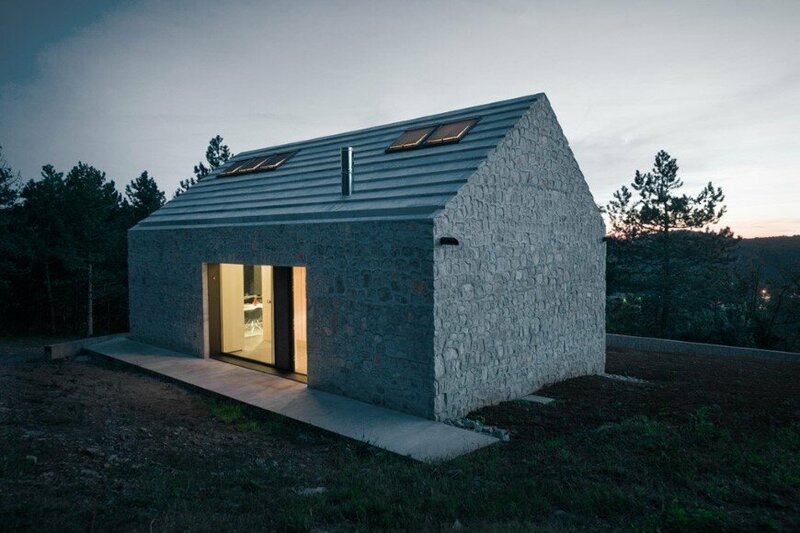 A 14′ x 12′ pivoting wall at the far end of the house either hides or reveals a multi‐purpose room. 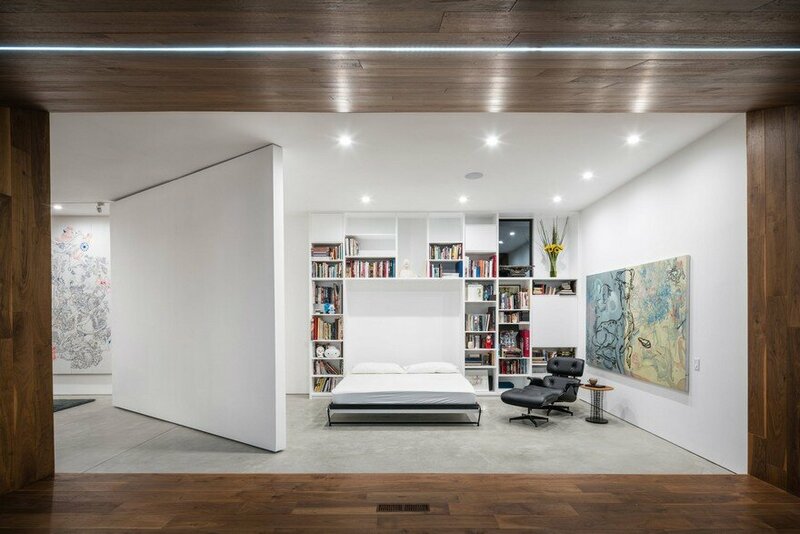 A built‐in murphy bed emerges from the floor‐to‐ceiling bookcase to transform the library into a guest room. The library offers varied storage areas, open shelving for books, and closed cupboards for private items. 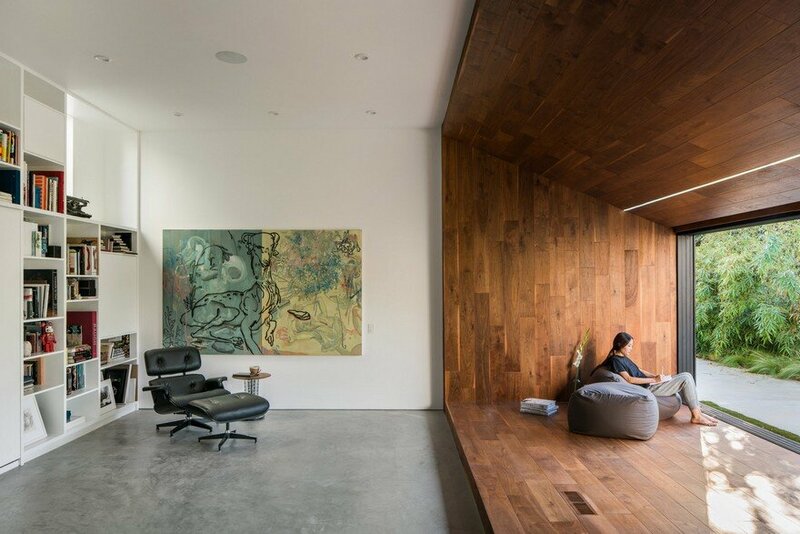 An Eames Lounge Chair invites reading and contemplation. 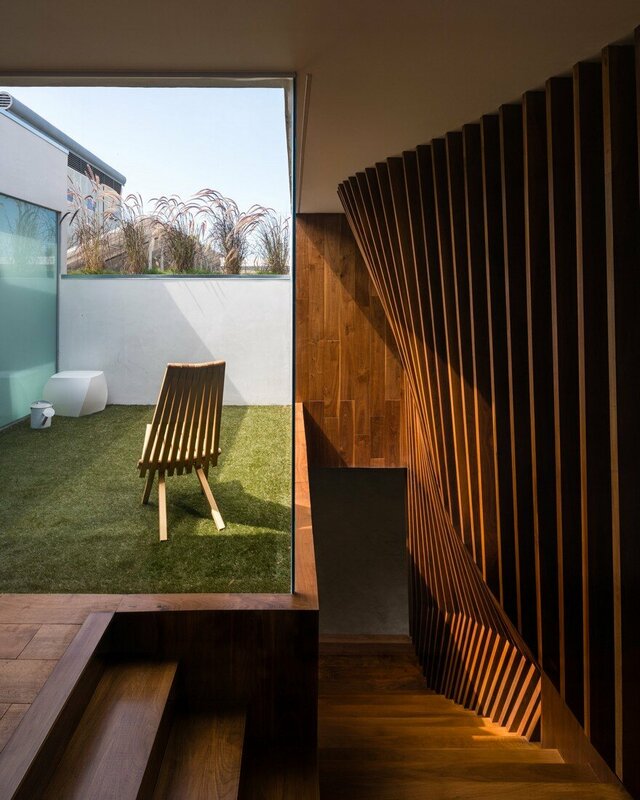 Taking cues from Japanese tea houses, Brunn designed a wooden box‐ like volume within that space for a variety of activities: social gatherings, meditation, or music performance. 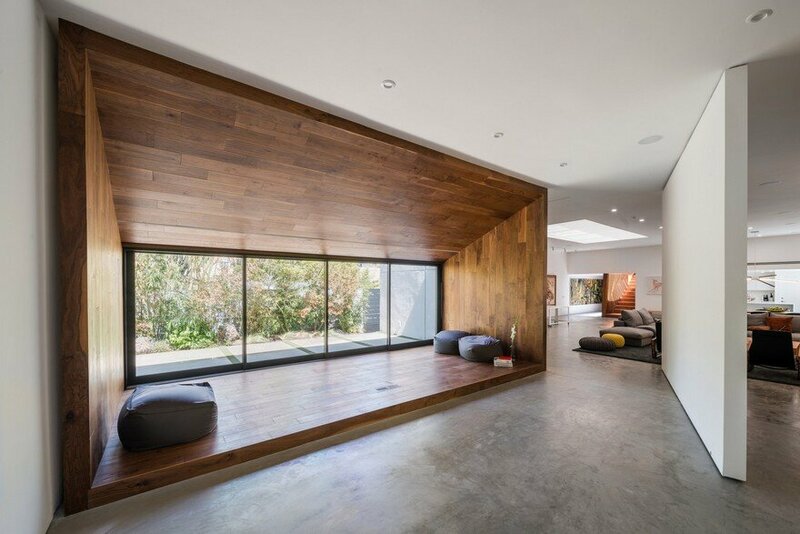 Walnut planks create canted walls that radiate out from the floor‐to‐ceiling sliding glass wall, with the wood surface rising along the slanted ceiling. 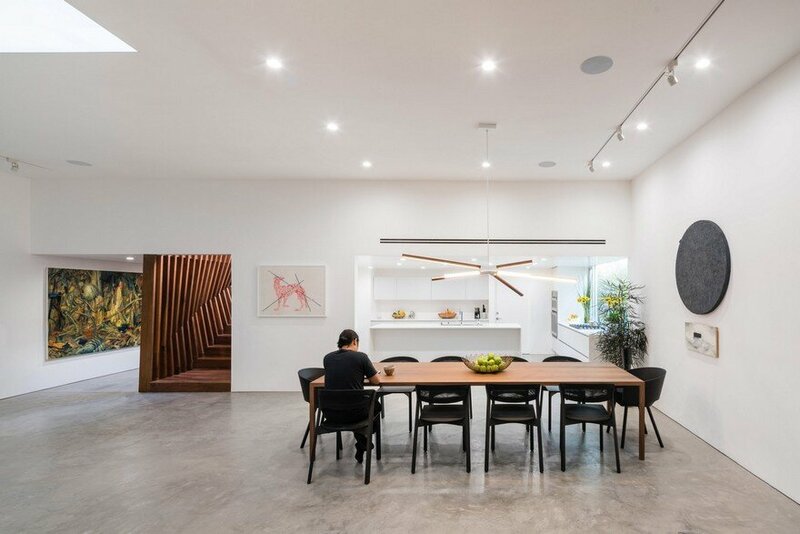 A strip of lighting subtly accents the ceiling piece and relates to various strips—dynamic chandelier, edge of the pivot wall, light through the stairway slats—that create a leitmotif throughout the HideOut house . A lush garden area is visible and reachable through the glass sliders. Copper paneling clads the exterior of the “tea house” volume. A Japanese garden featuring traditional species of bamboo, gingko, and Japanese maple was conceived by Hitoshi Kitajima of Kaisei‐en, who worked at the Tokyo Imperial Palace. He carefully choreographed the plants to beckon a serene and peaceful setting for adults, as well as offer a play area for the Jeans’ son. 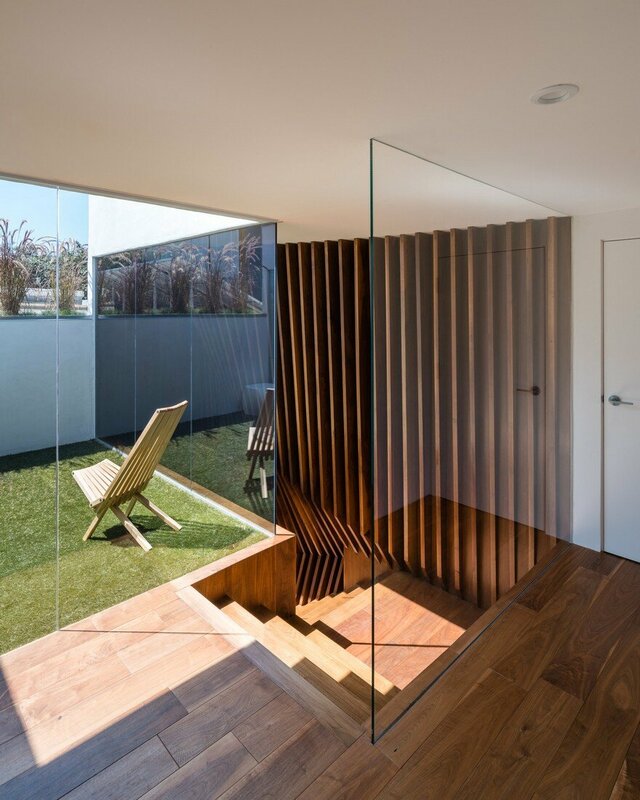 A concrete bench with wood slats relates to the interior and faces a wall that the artist will use as outdoor painting space. The bubbling rock fountain is placed according to Feng Shui notions of good luck and prosperity. Upstairs, natural light seeps into the stairwell tunnel through a glass‐enclosed open‐air meditative garden accessible through the master bathroom. Previously boxed in with no access to the outdoors, this area was designed as a garden space by Brunn to acknowledge Gehry’s original intention to make the area an encased greenhouse. This respite organizes the second level, and expands the otherwise small landing. Bedrooms are kept clean and serene. 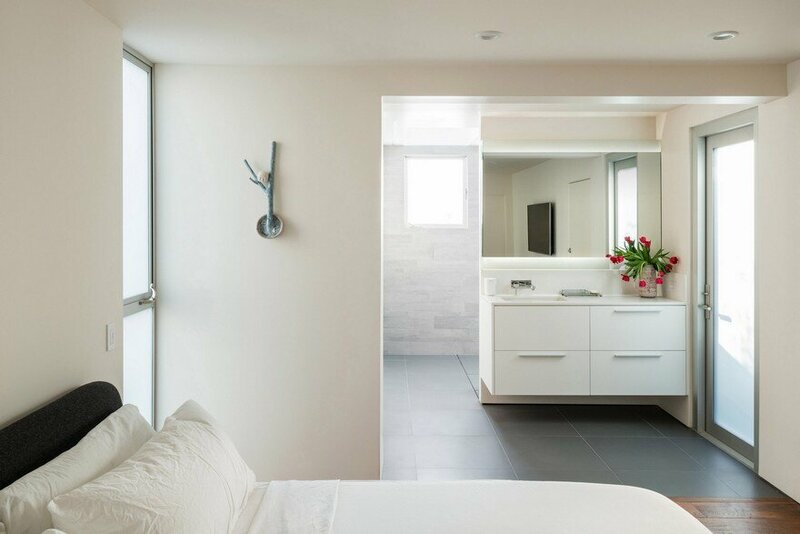 The master bath features a large, open shower with varying degrees of privacy; the glass wall facing the garden can be clear or opaque with the flick of a switch.